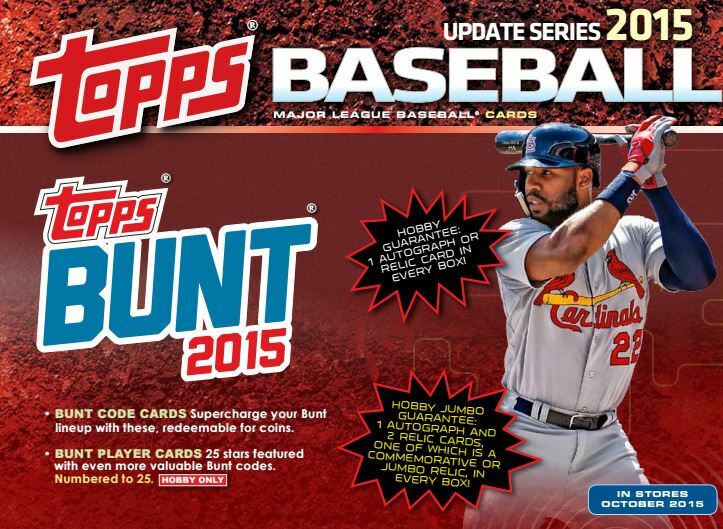 I thought this was pretty big news last week when we got word that Bunt would be a featured part of Series 2 with special player code cards that were made visible on the checklist reveal. Now that we have gotten a sales sheet for Topps Update, as well as some information from someone who opens a ton of Topps’ boxes, I think there is more information to draw conclusions. Here is what we can take away. First off, it looks like the player code cards are pretty rare – numbered to ONLY 25. In a product like this, something that is 25 or less is like finding a needle in a haystack. Those are going to be EXTREMELY tough pulls. One would have to guess that the group of cards that are in Series 2 will be very similar if not identical in the way they are structured. This means that for Series 2, the player cards are not a huge part of the promotion, but are definitely worth keeping your eye out for. We also see that there is a group of Bunt “code cards” that are redeemable for coins in the game. Based on the history of codes in the Topps products, these should be READILY available in every Topps Update Jumbo or Hobby pack. I think I might need to be opening some boxes now, especially if Bunt codes are a big part. Now, we dont have information of Bunt codes in Series 2, but its a definite possibility based on pack odds provided by one of the people I follow on Twitter. Based on pack odds printed on the Series 2 wrapper, he said that the code cards should be available, but we will have to find out if his information is correct. If so, look out – there could be a BIG reason to go buy some packs of cards this Wednesday when Series 2 hits shelves. Either way, this is going to open up the physical card world for many people who have likely not opened many packs over the last few years. If you need any information – I have a physical card site at www.sportscardsuncensored.com that functions as a sister site to this one. Lots of information is available there. This entry was posted in News and tagged Baseball Cards, Bunt, Football Cards, Huddle, Sports Cards, Star Wars, Star Wars Card Trader, topps, Topps Bunt, Topps Huddle, Topps Star Wars. Bookmark the permalink. This is quite exciting. I really like this idea. Thanks for the update! Looks like the Bunt player cards are Hobby Box only. At 25 copies each these will be extremely tough to find or trade for in Bunt. Who knows how many of the 25 will actually get redeemed? I also heard the bunt coin cards are limited to 1 per acct. I just opened a few so we will see! Ok just to verify, I tried the coin cards, I pulled 4 of them out of a box. I input the first and got 1000 coins, next one I tried said I have already used this offer, 1 per acct. leave it to Topps to be so cheap that 1000 coins per card is too much to let us have. Heck, even with the 4 I pulled out of a $50 box, I wouldnt even been able to buy a pack. I guess 1 per acct will keep them off eBay, maybe!